It's not hard to make athletes look silly. In fact, from encounters with law enforcement to the awkward poses they take with teammates and opponents to having too much to drink to just being plain ol' ugly, they often do it themselves. So it's truly adding insult to injury to make them suit up in hideous uniforms when they play. But sports owners do, over and over and over again. 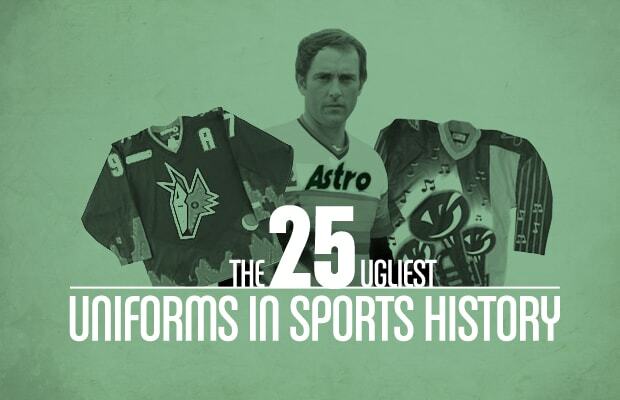 From theme nights to tie-dye, and bawdy mascots to painfully mismatched colors, these are the 25 Ugliest Uniforms in Sports History.